Professor Agasa has created a computer program that can give you the identity of anyone in the world. He decides to use it on figuring out who Kaitou Kid is. Before he does, the program gives him a history of the Kid, as well as preview clips of the eighth movie. When he is about to finally figure out who the Kid is, Kid appears on the computer screen, announcing he has hacked the program. Well, this episode just summarizes the story from multiple episodes that contain KID, and works as a pre-moive 08 episode or a trailer and tries to make everyone interested in the fight between Conan and KID. 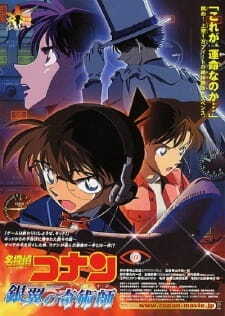 If you are into watching every moment of Detective Conan that you can get then feel free to watch it, other than that treat it as a trailer for movie 08 and just go watch the movie. Without going into spoilers territory this episode might get you interested in re-watching some of KID's episodes and trying to remember what tricks did he use but since there is no plot development and no actual conflict in the episode you might not enjoy it. It's wrooong! Watch episode 345 first. I know this has nothing to do with the content of the episode. But some of you may have been spoiled like me. Therefore i just wanted to warn you. Apart from this, it's just a recap of the story with Kaitou Kit. It summerizes Kaitoo Kid episodes as well as some Black Organization recaps and other character progresses. I cannot really say I especially enjoyed the old scenes from the series, i was expecting some background story for the upcoming movie but meh that's just a recap and a little trailer of Movie 08. that made me really want to skip it at one point.